Metro and the city of Los Angeles plan to launch Metro’s innovative bike sharing system in Venice on Thursday, September 7, bringing the distinctive, easy-to-ride bikes to one of the most popular beachfront destinations in Southern California. Metro’s vendor Bicycle Transit Systems, Inc. will install 15 stations with 165 Metro Bikes throughout Venice. 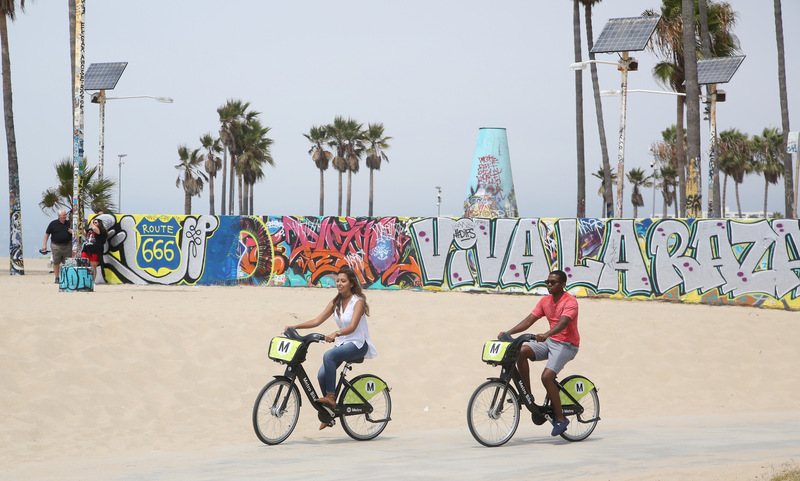 Destinations accessible via Venice bike share will include the Venice Beach Boardwalk, the Abbot Kinney shopping district, Muscle Beach, Rose Avenue, Downtown Santa Monica Expo Line Station, the 17th Street/SMC Expo Line Station and the Marvin Braude Bike Trail along the beach, among others. This will be the third launch of Metro’s Bike Share system this summer. Metro and BTS opened bike sharing in Pasadena on July 14 and at Port of Los Angeles on July 31. Together, the region’s three bike share expansions will result in approximately 1,400 bicycles at up to 125 stations. Metro worked closely with the city of Los Angeles to strategically place bike share stations at major destinations of most benefit to people living, working and playing in the Venice area. Metro is studying the feasibility of future bike share expansion to more than 20 other parts of the county, including Hollywood, North Hollywood, MacArthur Park, Koreatown, the San Gabriel Valley, East Los Angeles/Boyle Heights, Burbank, Glendale, Culver City, Palms and others. Metro seeks to create a regionwide system of more than 4,000 bicycles pending ongoing Metro Board approval. Prospective bike share users in Venice can now buy a monthly or annual pass for Metro Bikes by registering online at www.metro.net/bikeshare. A single pre-registered Metro TAP fare card can serve as the key to both Metro Bus and Rail lines and the Metro Bike Share system, making it the most integrated with transit than any other system in the United States. For a map of existing and future bike share stations in Los Angeles County, visit https://bikeshare.metro.net/stations/. To attend the launch event on September 7, which includes a free preview ride of the Venice Metro Bike Share System, please RSVP at https://bikeshare.metro.net/events/. I’m curious to know what riders who’ve used both think. The Metro-sponsored Santa Monica (and Long Beach and Beverly Hills) bikes are “leave-anywhere” – probably a necessity for tourism. The Metro-run system here (as I understand it) is hub-to-hub, good if there’s hubs where you want to start and stop and if the hubs are big enough to always have room. Seattle had a hub-to-hub bikeshare but they eventually closed it down. Weather and topography certainly didn’t help, but a big complaint, especially on the UW campus, was hubs constantly being full, causing riders to have to find a different hub (further from their destination or all the way back to their original pick-up point to drop the bike off) and then walk the rest of the way. Will having multiple bikeshares in Santa Monica be confusing? I am a founding member of the Santa Monica Breeze Bikeshare and really find it handy, use it every day as part of my commute after I get off the Expo.